Life and career choices based on fitting in often lead to personal and professional regret. I am not saying I don’t believe in being considerate of others feelings and beliefs… but I am saying that letting go of how you feel and how you believe just to ‘fit in’ is definitely not something I do or suggest to my clients to do. Trying to fit in creates a society of followers and what the world needs is a society of leaders that know how to lead and when to follow without trying to fit in. Trying to fit in often requires an individual to give up on their own desires and goals resulting, many times, in an outcome of regret. In my work I experience individuals who write resumes to fit a job description, join a cause because a friend did, wear a certain line of clothes because it is the new style. Are we losing our own individualism and personal purpose… all for the sake of fitting in? Being true to ourselves is, in the end what really matters. If we follow the path of our own personal truths we are happier and fulfilled; and the world becomes a better because of it. 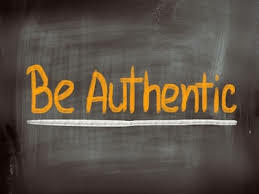 Authenticity is the best gift we can give ourselves; and authenticity is the best gift we can give the world. In living your truth all who encounter your presence will be gifted. Stop trying to fit in and set your pioneering soul free to explore, discover and contribute. Where would we be as a world and society without those who chose to break the mold and extend boundaries?